It came to my attention last month that Evernote enabled many actions via Launch Center Pro, including x-callback-url support. What’s impressive about this implementation is how the Evernote team were meticulous to empower its users with great control over parameters. 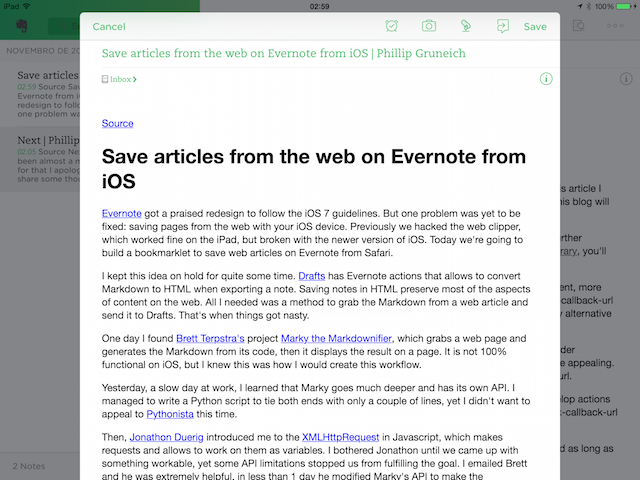 Over the years, Evernote became more than a web clipper or a rich-text note editor, it expanded to support reminders, presentations and the list keeps growing. The new Evernote URL scheme is perfect for quick input as it offers different types of note for the user to select on the go, although existing note manipulation is non-existent. There are two available actions: new-note and new-clipped-note, the former covers most note formats and the latter is dedicated to web clipping. The new-note action uses the type parameter to set the kind of note. Besides the type attribute, the new-note action also supports title, text, reminderdate, latitude and longitude. html: Creates a note with web content. The text parameter expects a valid HTML string without external resources. How every note type works offers as many possibilities as it does limitations. 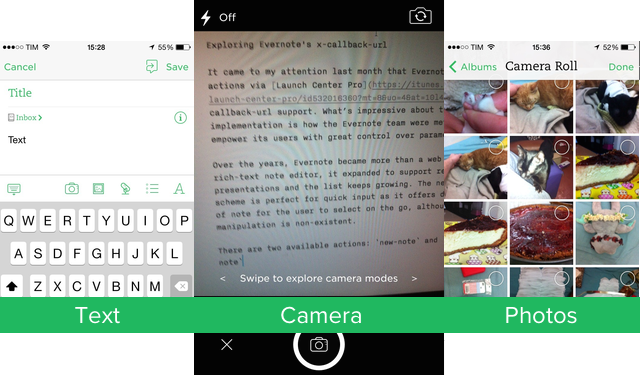 For example, there's no way you can select a photo outside Evernote, as in Launch Center Pro, and include it to a note with text using the clipboard. I'm also suspicious on the reasons behind the lack of support for the text parameter in the lastphoto note type. The list note is a disappointment as it joins multiple lines into a single task, ruining your formatting. I couldn't find a way to generate multiple tasks from an unique action. However, if I were you I wouldn't dump Drafts out of the loop yet, as we'll see next, they are a perfect match. I mentioned three parameters supported by all kinds of notes within a new-note action; latitude and longitude set the geolocation for your note and Drafts 4 brought the [[latitude]] and [[longitude]] template tags1. You can always install my Drafts keyboard extension to convert time strings to Epoch, but if the script doesn't work, there's not much I can do, read the articles I listed above and understand how the date conversion works. if you're still not convinced on how Drafts is the ideal companion to Evernote, the newest version also introduced a syntax to convert Markdown to HTML on the go, just wrap your text on double percent signs. According to Drafts's documentation, you should also enable the XHTML output to the Markdown conversion by adding the xhtml parameter to the tag. 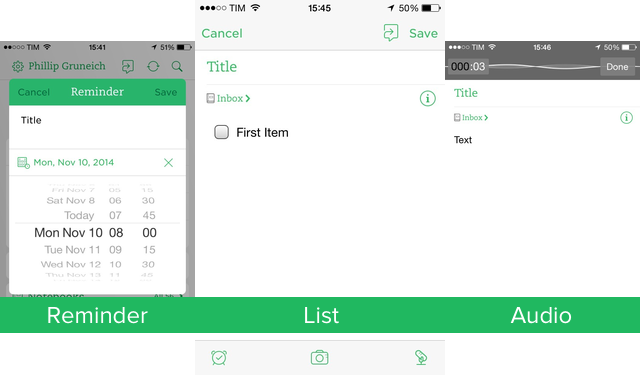 The current version of Evernote supports x-success, x-error and x-cancel. Earlier I mentioned another kind of action in Evernote, the new-clipped-note, which supports a single parameter: url. Beware! Don't encode the url you're passing as value or Evernote will throw an error. This action clips the entire page from the address you submit, works great for clean pages, although I wish it supported more parameters. 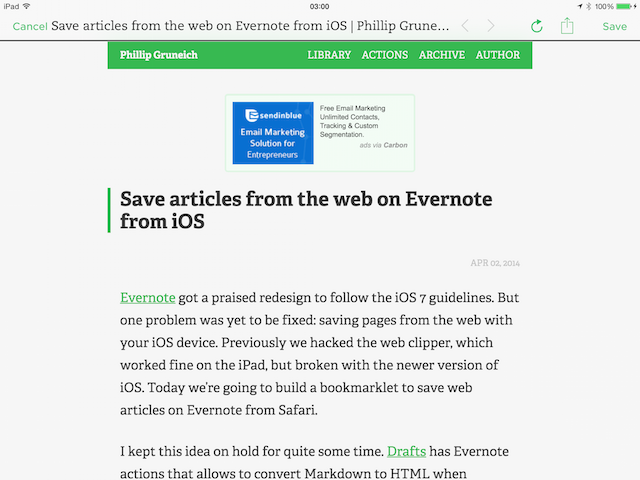 I hope this article sets a nice introduction to Evernote's x-callback-url and how you can take the app beyond what their brand-new extension has to offer. Don't think URL schemes are dead. At least not yet. Previous Why Do We Still Need URL Schemes When iOS 8 Brings the Sharing Dialog to Every App?